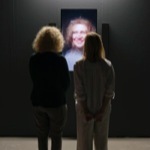 Rafael Lozano-Hemmer - Project "Redundant Assembly"
In "Redundant Assembly" an arrangement of several cameras composes a live-portrait of the visitor from six perspectives simultaneously, aligned using face detection. The resulting image is uncanny, detached from the laws of symmetry and the depth perception of binocular vision. 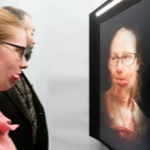 If several visitors are standing in front of the work, a composite portrait of their different facial features develops in real time, creating a mongrel "selfie". 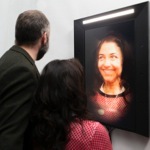 A version of the work for public space includes a time-component that allows the face blending to take place mixing present and the past. 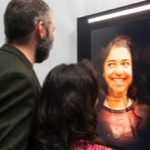 Face recognition is a technique often used by police, military, and corporate entities to search for and find suspicious or target people. 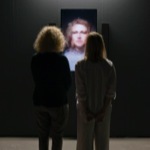 Here the same technology is used to confuse portraits and emphasize the artificiality and arbitrariness of identification. 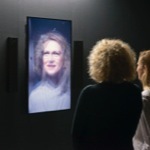 Relations, Kunstkraftwerk, Leipzig, Germany, 2018 - 2019. B3 Biennial of the Moving Image, Four Frankfurt, Frankfurt, Germany, 2017. Aproximacions Creatives - Collecció BEEP d'Art Electrònic, Museo Salvador Vilaseca, Reus, Spain, 2017 - 2018. Sin Título (Untitled), Jonathan Ferrara Gallery, New Orleans, Louisiana, United States, 2017. KM3, Quartier des Spectacles Montréal, Montréal, Québec, Canada, 2017. Redundant Assembly Projection, Festival de Luz y Vanguardias, Salamanca, Spain, 2017. 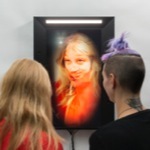 Seeing Now, 21C Museum, Nashville, Tennessee, United States, 2017. ARCO '17, Colección BEEP, Madrid, Spain, 2017.